Hey-Ohh! Bay-area style, minus the rain...and style. 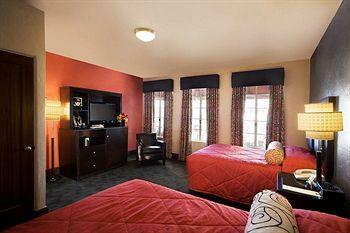 The Golden Gate Las Vegas hotel rooms are freshly renovated, modern looking with nice beds, clean and priced fairly. They are also very, very small, meaning they work for sleeping, but not for Greco-Roman wrestling. Yes, this was a disappointment for us, too. 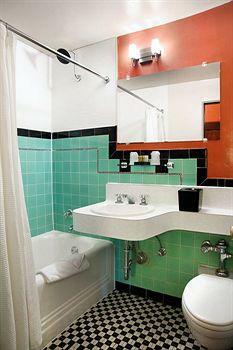 Bathrooms are similarly dinky, with a tub/shower combo (or just shower in some) and single sink. No irons or safes, but they do have coffee makers and a complimentary newspaper. The Golden Gate Hotel and Casino Las Vegas only has a few floors, and they are all below the Fremont Street Experience, so if you're a light sleeper, ask for something on the backside of the joint. Not so hot. This is a teensy-tiny casino, and the pit bosses and security guards at Golden Gate Hotel Downtown Las Vegas have a reputation for scowls. Don't expect fresh towels delivered right away, or someone to give you a pedicure. You might get that at luxury Strip hotels, but come on - this is Downtown Vegas, they expect you to be rough and ready. Just soap and cheap shampoo, and if you don't like it, boo hoo. A typical downtown crowd. People who don't need to impress anybody on the Strip, and are looking for comfortable surroundings in which to lose a few bucks. These people are serious about gambling and not about bringing pictures of their hotel rooms back to their neighbors. 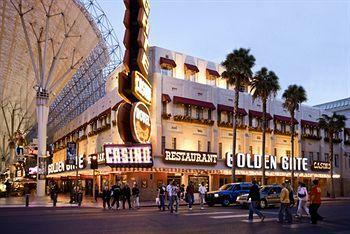 No pool, but we heard Golden Gate Hotel Las Vegas is built on an aquifer if you want to dig. If you don't mind the smallness, there's a certain niche that Golden Gate fulfills that is worth your money. Blackjack, craps, Let It Ride, Caribbean Stud and Roulette. They have pretty good double-deck blackjack games, and good, fun craps. They also have stages in the pit for go-go dancers. Although, they tend to dance just weekend nights. $5 and up at the blackjack tables. It'll go higher when it's really busy, but one of the nice things about Downtown Las Vegas is it never gets as crowded as the Vegas Strip. Craps is usually $3 (sometimes $5), with awesome 10x odds for $5 bets (and crappy 2x odds for $3). The Let It Ride and other games are $5 at Golden Gate Las Vegas Hotel. Regular old slot machines and video poker. You have about as much chance of winning on these machines as you do anywhere else Downtown. The selection at Golden Gate Hotel Las Vegas is limited by their size, so don't expect obscure games. Their video poker selection is poor. Don't worry, there is better video poker in Vegas to be found. Good. The Golden Gate Hotel and Casino Las Vegas doesn't need a whole lot of waitresses in this place, and the few who are there cover the ground well enough. The place is small enough to allow you to flag a waitress down from across the casino. $10 bettors playing several hours can hook themselves up with a meal, $25 for a while may score you a room at Golden Gate Hotel Las Vegas or at least some good mailings for future comps. In this place, if you throw around green chips they will certainly notice you and befriend you. The slot club, Club 1906, serves the slot player among us and gives slot play rebate at 0.20%. A total of zero TVs. This is bad, but better than a negative number, which would mean they come to your house and take yours. There are no seats since the sports book is just a kiosk crammed into a corner near Fremont Street. 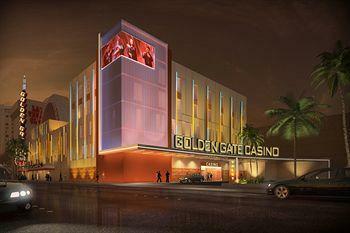 There is approximately one automated kiosk for betting at Golden Gate Hotel and Casino Las Vegas. No human interaction. You can probably snag a cocktail waitress and convince her to bring you a drink, but then you have to stand there looking dopey until she comes back with it. The snack bar is not nearby, but Golden Gate Hotel and Casino Las Vegas is small enough that you can run over to it, grab a two-dollar shrimp cocktail and only miss a couple of pitches. This Leroy's outpost is one of the crummiest books in town and is now just an automated kiosk. The kiosk isn't even always working correctly. 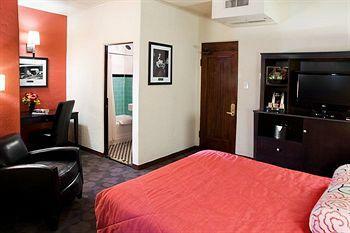 Choose between a queen bed or two double beds in the standard room at Golden Gate Hotel Las Vegas. Rooms come with high-definition TV and cable, wired and wireless Internet (for a surcharge), clock radio, and an iron/ironing board on request. Bath amenities include hair dryer and complimentary toiletries. I've stayed here a couple of times. This visit the GG was generous enough to comp me one of their suites. I couldn't have been more satisfied. The room was modern and squeaky clean. The shower was huge! There was a generously large TV viewing area. IMHO the GG is the best casino down town. They feature $5 craps with generous 10x odds. The dealers are excellent and so is the action. The drink service is fast. And did I mention the dealers? The scantily clad dancing dealers give this place energy. The only slight negative is the Du-Pars Restaurant prices are a little high. You can find better food options on Fremont. I'd recommend this place any time, but particularly in the winter when you won't miss a pool option. The Cheapo review is fairly spot on. Small but clean rooms, slow service but good gaming action. When we stay downtown it's usually at the Golden Nugget but we received an offer for free stay, play and food so booked a night. 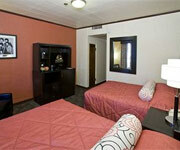 New carpeting, bedding and paint gave the oldest casino in Las Vegas a nice makeover. We did well on the slots and beer service was slow but enjoyed some of the visual amenities.